You ever hear a song on the radio with a drastic reverb on the artist's lead vocals that sounds really amazing (Post Malone for example), then, when you try to replicate that reverb at home, it just sounds washy and kind of amateurish? While everyone knows about reverb, not everyone knows how to tastefully set it to make it work in the mix, as it’s not always just a case of "set and go." Delay, another common effect used on vocals, can also be similarly hard to get right. Professionals who have been mixing for a long time have learned how to really dial in effects like reverb and delay so that they create a pleasing effect without being overbearing or stepping on any other part of the mix. Once you understand the fundamentals of how to make reverb and delay work naturally in a mix, you'll be able to match the quality heard in so many radio hits—and then, if you wish, you can push your mix further into a more experimental sound. As a full-time engineer at Chicago's Studio 11, I'm often working with hip-hop vocals, which, traditionally speaking, are very percussive, quick, and dry. But even in these situations, you can use a short-tail reverb to get the vocals to gel with the other instruments and get them away from that dead, dry-in-the-booth sound. Even if the wet/dry is on 1%, it does make a big difference in the context of the mix. Whether you're working in hip-hop or any other genre, one key technique for keeping reverb out of the way of vocals is setting the correct tail, the length of time the effect will be applied once triggered. 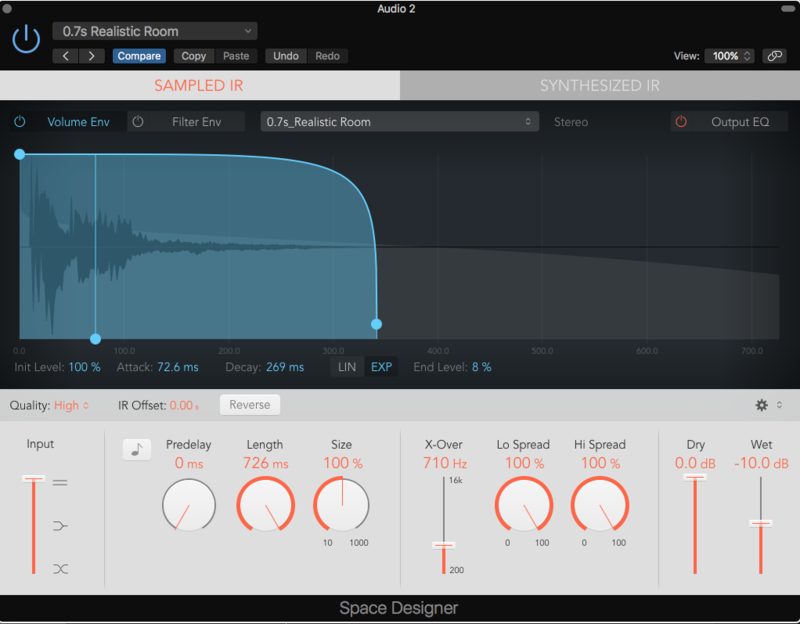 A tail set to 269 milliseconds in Logic's Space Designer reverb plugin. If the artist is speaking fast, I’ll usually put a shorter reverb with the decay of the reverb's tail stopping before the next word so that it pulses in rhythm with the tempo of the rap. There are a couple ways to do this. One is you can measure the time between the transients of two words in milliseconds to get a precise measurement of the decay time. Most DAWs have this ability. In Pro Tools, just selecting the measured space will show the time in milliseconds in the Transport window. You can also measure the milliseconds based on the tempo of the track (selecting 1/8, 1/16 note, etc. on the grid) to give a rough overall decay time. Another way to do this is to use your ears. I like to crank the reverb wet/dry all the way up to hear this, while listening specifically to the decay of the reverb tail. Then, when it sounds like it’s pulsing in beat with the lyrics—with the tail stopping before the next word—you can adjust the wet/dry according to taste. Either way, these methods will help ensure a subtle, tasteful, short reverb on vocals. 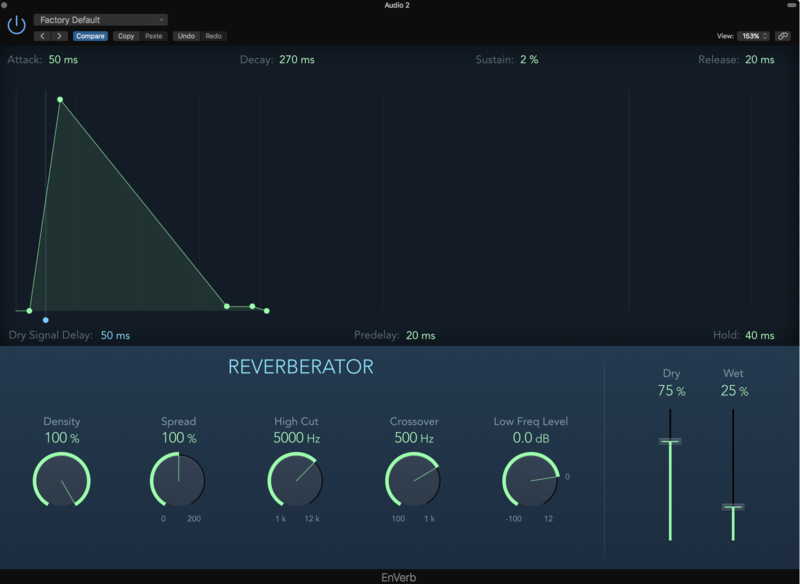 Another important aspect about reverb is the pre-delay, which is basically when the reverb actually comes in. I kind of look at pre-delay as the "attack" of a compressor, where if you set it longer, the original sound is able to poke through first before being effected. Think of it as "fooling the ear" to be able to add more of that nice reverb sound without it muffling the intelligibly of the lyrics so much. This can be ideal for a medium to long reverb, where you want that slightly drowned out effect, but also don’t want to lose the clarity of the words. Setting a pre-delay to come in a little after the transient of the words lets the initial attack come through clearly. The pre-delay can also be set according to the tempo of the track, like the reverb's decay time. Using the same methods for finding decay times, you can measure a desired time for the pre-delay slap to come in. I usually measure a shorter time on the grid (something like 1/64, or 1/128 note) and set the pre-delay to that. 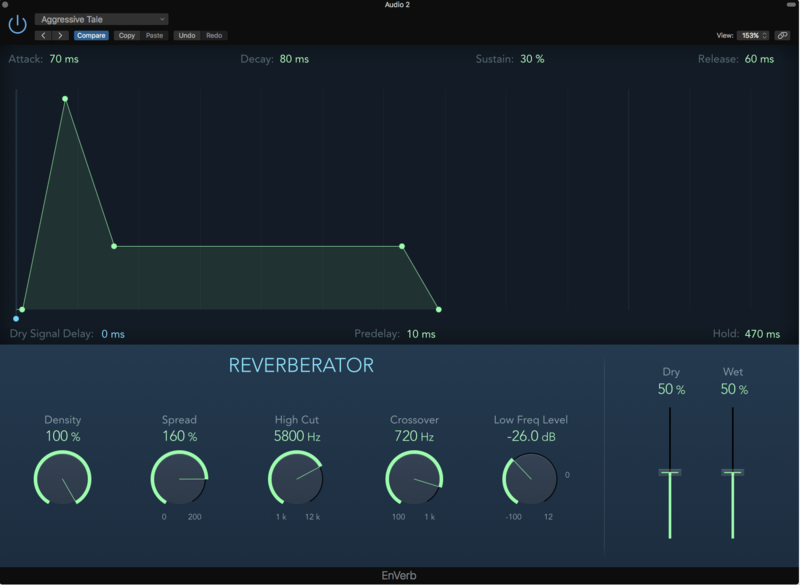 A pre-delay of 20 ms set in Logic's EnVerb reverb plugin. Long reverbs can add a great sense of space and texture to a mix. These can be a little trickier to set, as they have more of a dominant presence, unlike the subtle glue of a short or medium reverb. So it's worth spending a little more time selecting the best-sounding reverb that works with the song, adjusting the decay and pre-delay accordingly, and molding that reverb so it doesn’t step on anything you don’t want it to in the mix. There are some specific reverbs that most professional engineers choose, whether they're in outboard or plugin form, that just naturally have pleasing qualities to them: Think AMS, Lexicon, and Eventide for hardware; Audio Ease Altiverb, Avid Reverb One, and Waves Renaissance Reverb or TrueVerb for plugins. While I agree that these units have a nice charm to them, you can still get a big-budget reverb sound with stock reverbs in your DAW, you just have to know what to look for and know how to treat them. So, aside from the aforementioned timing with long reverbs stepping on vocals, there is another aspect of reverb that can also step on vocals (and other parts of the mix if you're not careful). It's the overall tonal quality of them. A long tail in Logic's EnVerb plugin. Then, on the other side of the spectrum, a room may also have a lot of high-end flutter, depending on the material used. Sometimes this high-end is nice, but sometimes it can step on the articulation of the vocals, especially in "essy" ranges, or on things like hi-hats that you want in that same higher frequency range. There are also buildups that can happen in the mid-range, say, between 300Hz to 500Hz, or around 2kHz. You just have to use your ears to see what part of the reverb you don’t like. Once you’ve tailed the sound of the reverb, then you can bring the send back down to taste. The end result should be a reverb that complements the vocals and doesn’t step on anything in the mix. Then, seeing how you have the reverb on a separate channel, why stop with EQ? Try adding a phaser/chorus, compressor, or spatial plugin to get an even more interesting reverb. The combinations are endless. When asked once what his favorite reverb was, well-known engineer Andrew Shepps said, "Delay." Delay is a great way to add an overall "wetness" to the vocals without actually swamping the vocal with reverb. A combination of delay and a lesser amount of reverb is a great way to really wet up those vocals without it seeming like too much. Delay, however, has similar issues with reverb. It's very important to set the timing correctly. I would start by syncing the plugin with the track's tempo. Luckily, nine out of 10 delay plugins in have this ability. Then, set the note division according to taste. For general purpose, 1/4, 1/8, and 1/16 notes should cover it. But there are times where you may want to go higher for a desired "flutter" effect, or even do more interesting time divisions, like triplets or dotted note repeats, but that's another topic in itself, as it can get quite experimental. Most delays have a feedback knob or setting, and this is where most people go wrong. Having too much feedback can step all over the next words in a song and actually decrease the clarity. Or, maybe there is one spot in the song, like at the end of the last chorus, that sounds cool with a longer feedback, but then when you go back to the middle, where other words crowd the chorus, problems will arise. After setting the feedback to taste, there is the issue—similar to the tonality of the reverb stepping on other parts of the mix—of the overall frequency curve of the actual echo itself. Some plugins will have built-in low-pass and high-pass filters, like my all time favorite: Waves H-Delay. But others may not have that option, in which case you'll have to do the same thing as the reverb and set up a separate auxiliary send and return. If so, just follow the same steps we outlined above for reverb. There also is another way to make sure the echoes don’t step on the lead vocals: Add a compressor after the delay and side-chain that to the lead vocal via a send. Doing this is pretty effective, as when the vocals are "active" or heard, the delays are being squashed and lowered; then, when the vocalist stops—even momentarily—the natural decay of the vocal's envelope will let the delay creep back in during those quieter moments between words. So far, these techniques have been concerned with adding a "static" delay, or, in other words, a delay that remains the same across the whole vocal to create a sense of space and overall bounce. But there are also times where you just want a longer or different delay on one word. The traditional way to do this is to set up another auxiliary track with your desired delay settings, then automate a separate send on and off for those specific words. The benefit to doing this, of course, is that you can set different amounts of delay you want on specific words—maybe a subtle delay on one and then a drastic delay on the next. But another quick way to do this that doesn’t require time-consuming automation is to copy the vocal channel, add a delay to it at 100 percent wetness, turn the channel down a bit, and then just copy the words you want delayed and drop them in that track. It's a great way to quickly add different delays without going through the time to automate sends. Up until now, all of these techniques have been catered toward lead vocals, but what about background vocals like stacks or ad-libs? These are a bit more subjective, but what I like to do is create a contrast between the sound of the lead and the sound of the second vocal—not only to separate them tonally, but also to create some sense of depth or stereo spread to the song. On stacks (otherwise known as double-tracked vocals, or dubs), generally a longer delay tends to clutter things, but a shorter stereo slap delay with one side set different from the other can actually create an expansive, chorus-type effect, which pushes the doubled vocals to the sides of the stereo field. Reverb on stacks is also up to you, but if the lead is wet already, you may want to leave the reverb on doubled vocals drier, just to add a bit more articulation. As you’d imagine, a long reverb on the doubled vocals with another long reverb on the lead can make things a bit washy. But there are no set rules. On ad-libs, however, it’s a whole other story. If the lead is fairly dry with a subtle reverb, I like to throw the ad-libs into outer space. What I mean by outer space is a long, drastic reverb that creates a large sense of depth in the mix. With the lead up front and stacks pushed a little back and to the sides, the ad-libs can go far away in the distance. That said, medium or short reverbs will, of course, work just fine. And if the lead has a washy reverb, sometimes a drier ad-lib creates more interest. Feel free to get creative with the delays on the ad-libs too, as generally they don’t happen as much in the song, so they're not in as much danger of stepping on other parts of the mix. Changing the delay time to triplets or dotted notes can add an interesting rhythm to the empty spaces. Play around and see which ones work the best for the song.